How are you transferring the video from the camcorder to your computer. "transferred by usb cable" tells us nothing. 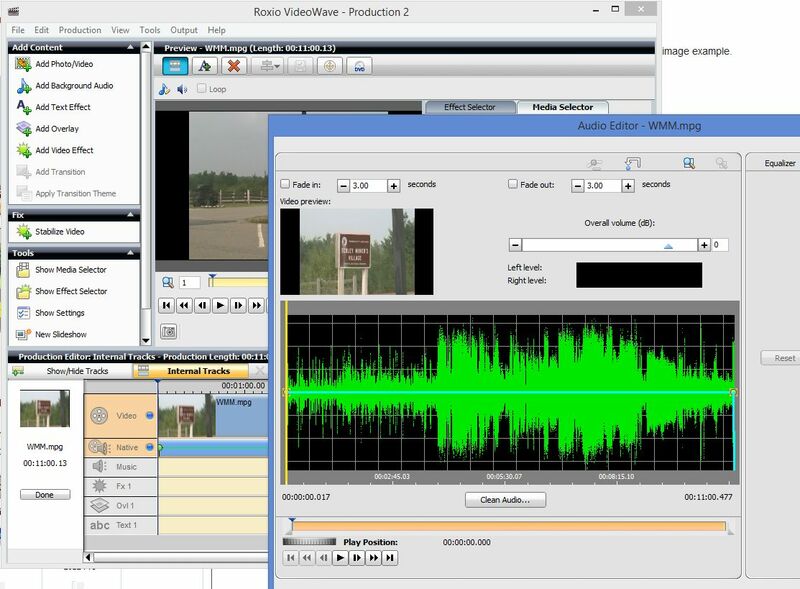 What software are you using or are you simply using Windows Explorer to copy the video files from the camcorder to the computer? Why are you recording in SD if you have a HD camcorder? I have the 3D version of that camcorder. Do you hear the audio when you play it back on the camcorder? When you bring the video file into Video Wave and select to show the native (audio) track, is one there and is it near the middle height of the track? Did you use the built in mic or an add-on mic? Could you record a short clip (30 secs or so) and upload it to a webhosting site or such, so that we can download it and check it out? Can you also post the properties of your clip, especially the audio ones? Again I ask, how are you "transferring" the video clip from camcorder to the computer? What about the other question sknis asked about viewing the native audio track? What happens when you record a HD clip and add that into Videowave? We are transferring the video clip from camera to computer via a usb 2 lead directly. Not sure that I can answer your queries fully. Tried uploading the film on this software, but its not permitted. Will be grateful for any further help, if you can. You can upload the 3 second or so video to this file sharing site: Yaa. Post a new video of nothing that you record. Do not post anything that has been through Video Wave or other video program. As a last resort, download a free video converter like "Any Video Converter" and change that video file to an mpg2 file. it will take only a few seconds. Put that file into Video Wave and see if the audio is there. The question about "how" you are transferring the video from your camera to the computer isn't about the physical connection, it's about what application (program) you are using to do it. Can you tell us what program you start to do the transfer? Is it Windows Explorer? Are you doing it somewhere in Creator? If so, where, tell us what selections you click to move the movie file(s) from the camera to the computer. Tried separately placing film through Videowave and selecting hidden tracks and select native, as suggested below. Still no sound. We will try the video converter later today, and let you know how we get on with that. Many thanks. 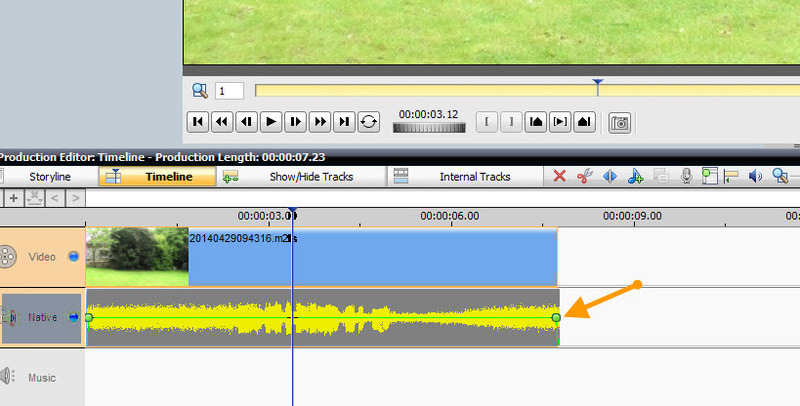 Sorry, I downloaded that short video (thanks) and got the audio track - actually loud ! When you put the video into VideoWave and selected to show the native track, was there an indication that it was there -- either a straight line or the audio squiggly line? See image example. If you see the squiggly line, then my guess is that there is an audio setting on your computer that needs to be changed. We didn't talk about your computer nor computer settings nor operating system yet. Do this. Open Wideo Wave and put that video onto the timeline. 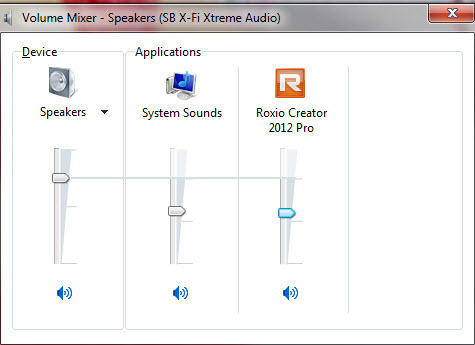 Click on the speaker icon on your taskbar (bottom of the Windows page). Select mixer. You should see a entry for Creator. Make sure that that section is not muted and that the volume is at or near half way. Thank you. We have done as you suggest and we have put the video into videowave and selected to show native track. It appears fine and has a straight line through the middle - but still no sound. We have checked the volume speakers. Roxio NXT Pro 2 is set at 62, which we assume is its default setting. The videowave setting is 100 and it is definitely not muted. We alas still have no sound. When we view that video as it was sent to you, (not in videowave), we get the volume perfectly ok. Do we gather you may have put this into your videowave software and have been successful? What audio device do you have - card or chip? Have you updated the drivers for it? Do you have the latest version of Quicktime on your computer? You do need that for the codecs. The only time I had heard of a similar problem was with PhotoShow (a different program) when IE was updated. A few people lost their audio but a later update fixed that. I know that the program does have some issues with " mov" video file audio from video taken with digital camera being used as camcorders. For that the only cure is use of the converter. Some converters will do a batch convert (many videos at once); mist are very fast. If nothign else works, then you will need to use the converter. I don't know if the following are needed for codecs or just to register/play videos. You don't need to use them but they are part of the requirements. Why did you install a codec pack? Since everything else has failed the codec pack may have changed the primary codec for the audio from that video to one that Creator doesn't like. You would not need to install any codec pack to run Creator other than the ones I mentioned above. I'm not an expert on codec packs - never used them - but perhaps someone will chime in here and offer some suggestions which I get myself educated. Our computer is not a standard model - it was put together by 'P.C. Specialist' in England to our own specifications. It has Windows 8.1 and is designed to be powerful enough to cope with video editing. We capture video from camcorder to the computer. We have taken codec off. Am I perhaps on the right path, that I should now instal Video Converter software, as previously, I said a free version did actually work and gave us the sound. Why are you capturing the video from your camcorder to your computer? All you need to do is use Windows Explorer to copy the video files from the camcorder to the computer. There is absolutely no need to "capture" unless your camcorder uses tape as its storage medium. Could you post a screen snapshot showing the Videowave screen (timeline view) with the add video clip. 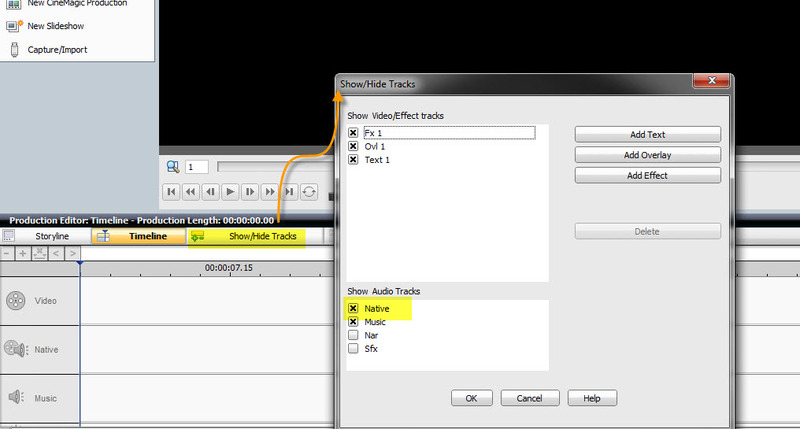 Make sure the native audio track also show. ...and HOW are you capturing your video? IT SHOULD NOT MATTER but try using the video files directly without resorting to any Scenes. Just add them into VideoWave, I want to see if that will have any effect on them. Edit: Have to ask, are you any relation to Sir Ernest Shackleton?